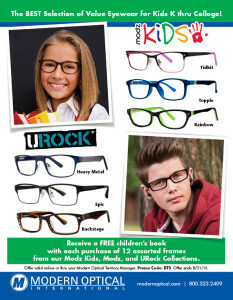 Roselle, IL – Back by popular demand, value eyewear leader Modern Optical International kicks off the back-to-school season with its FREE kid’s book giveaway! The back-to-school season is officially underway, and Modern Optical wants to help ECPs build their waiting room libraries. Children’s books entertain and educate young patients while creating a warm, family-oriented environment. Each colorfully illustrated book that Modern Optical is giving away has an age-appropriate optical theme and story line that both kids and parents will enjoy! ECPs will receive one free children’s book with every assorted 12-piece purchase from these popular collections: Modz Kids, URock, and Modz. When placing an order, ECPs should use Promo Code BTS. Offer ends 8/31/15 or while supplies last. Contact Modern Optical for complete details. The Patch, by Justina Chen Headley. The kids at school want to know why Becca is wearing glasses and a patch. To explain her new fashion accessory, she leads them on adventures that leave them both puzzled and entertained. Does an Owl Wear Eyeglasses?, by Harriet Ziefert. (Oppenheim Toy Portfolio 2014 Gold Seal Best Book Award Winner) This title presents a series of silly questions about the visual capacity of various animals that leads to an exploration of why some people need glasses. Pearl and Wagner, Four Eyes, by Kate McMullen. There’s an eye toast toady, er, that’s eye test today at school, but Wagner can’t see the board. Wagner vows to never wear his glasses again, until Pearl and all of his friends give themselves inspired new nicknames. Agapanthus Hum and the Eyeglasses, by Joy Cowley. Agapanthus Hum is always running around, but now that she has eyeglasses, how will she ever slow down? Her parents have some clever ideas. Optical Illusions, by Keith Kay. Bats and birds that look like faces. Skulls that pop up on anything white. Three donkeys with three ears between them. And walls that disappear. Relax; they’re only optical illusions! Providing a selection of children’s books makes an eye care practice a kid-friendly place that welcomes the whole family. Start growing your library today! Modern Optical International, based in suburban Chicago, is a family-owned and operated business started in 1974. A provider of quality eyewear for men, women, and children, Modern Optical is an industry leader in the value-oriented eyewear market. With 17 unique collections representing over 800 styles, Modern Optical frames are a perfect fit for managed care, price specials, second pair sales, and frame and lens programs. For more information, please visit www.modernoptical.com or call 800.323.2409.